Risk curves have been developed for the purposes of reflecting the risk of extended energy shortages in a straightforward way, using a standardised set of assumptions. On the Hydro Risk Curve graph, the amount of potential energy stored in the hydro lakes is shown on the y-axis (in GWh). The x-axis shows the time of year. Controlled storage is tracked over time – as lake levels rise, the trace moves up the graph. When controlled storage is in the green zone, there is no reason to expect energy shortages in the short to medium term. If the controlled storage trace falls below the green zone, the security level changes to reflect increased risk. At the X% line, there is an X% chance of lake storage falling to the zero line later in the season, based on the historical record of lake inflows. For instance, if controlled storage falls below the 10% risk curve, one in ten historical inflow sequences from the last 80 years would lead to controlled storage running out. This 10% risk curve is called the ‘emergency zone', and has not been crossed in the last decade. 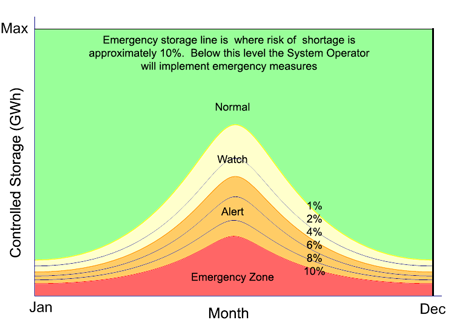 red zone (ie below the 10% line) the status is Security Emergency. The actions that are taken when these statuses are reached are described in the Emergency Management Policy. historic inflow sequences are used to represent the range of possible future inflow sequences. These assumptions are used because they provide a plausible and stable benchmark to assess risk when controlled storage levels are low. They are not applicable when controlled storage is at average or high levels because all thermal plant would not then be expected to be operating. If there are material changes to any of these assumptions, then we will update the risk curves.